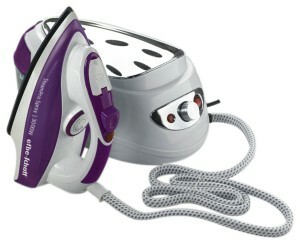 Design plays a crucial role in any steam iron’s efficiency and effectiveness. Not only does it have to have a large enough tank but its steam vents have to be positioned just right to maximize the high heat the iron brings to the surface of the fabric being ironed. After all, it is the combination of the right amount of moisture, a high enough level of pressure, and, of course, high heat that knocks out even the most frustrating of creases or wrinkles. If you are dealing with very thick fabric or dry fabrics that crease easily, you’ll know exactly how frustrating ironing can be if you are using a device that doesn’t have the right mix of these three wrinkle-busting factors. This is why there’s a lot about the SPS511 to be excited about. Just one look at the Team SPS511 C Efbe Schott Steam Pro Spray Iron should be enough to tell you that this iron means business. Everything from its damping system, its vent location and design, and its power level indicates that it aims to be the worst enemy of wrinkles and creases. Of course, it is tempting to think that any specialist device designed from the ground up to take care of business would cost an arm and a leg. Miraculously enough, this unit will only set you back 35.15 GBP. Imagine that-all that steaming power, integrated design, and 3000w of power for only 35.15! So as not to get ahead of ourselves, read by the feature by feature analysis below so you can be fully locked into what makes this unit worth buying and what should give you second thoughts regarding this model. While modern steam irons come with all sorts of fancy and attention-grabbing bells and whistles, all such features are mere empty details and worthless claptrap if an iron doesn’t deliver the steam power users demand from it. Steam power is non-negotiable. The amazing thing about this unit (in light of its low price) is it is able to deliver professional-grade steam generation at high temperatures easily and conveniently. Instead of waiting for a while for the iron to get hot enough, this unit’s steam generation system delivers all the high pressure steam you need for any load from a light to moderately heavy job. In fact, in normal circumstances, you can iron up to 40 minutes with one tank thanks to this unit’s 700ml water tank capacity. This unit is designed for serious steaming. For proof, you only need to look at the soleplate. The Team SPS511 C from Schott has 21 steam vents to deliver over a wide surface. This model also features world’s first damping spray. Talk about serious steaming power! While the Team SPS511 C has definitely made a very strong case that it has steaming functions locked down, it doesn’t just bring heavy duty steam power to the table. Indeed, even if this is all this model offered, it would remain a great buy due to the fact that this unit is so affordable. In addition to heavy steam power, this model also very convenient. One of the greatest hassles of using steam iron is when you have to reload water into the iron because of the iron’s minuscule internal water tank. Nothing can dramatically crash your ironing productivity than having to stop everything and reload your water tank. You might end up distracted and do other things around the house. Ideally, you should iron a load in one sitting. Thankfully, the SPS511 C lets you do exactly that. Steam power and volume are crucial but without high enough heat levels, a steam iron won’t be very efficient. The secret to effective and productive steam ironing is, after all, the right mix of steam power and high heat. With the right combination of these two, even the toughest crease or wrinkle will smoothen right out. If the low 35.15 GBP price of this unit has created doubt in your mind whether this model can produce high enough temperatures, stop doubting. This unit has a 3000w power input. That’s a lot of power for heat generation! Limescale or calcium buildup is one of the biggest problems of iron owners. Rapid limescale buildup has led to steam iron owners buying new units prematurely. Their steam irons just died far prematurely thanks to the rapid onset of limescale heavy water deposits. Make no mistake about it, limescale production is a serious headache due to the narrow, hard to access water channels of a steam iron. Considering the narrowness of these channels, high calcium water or hard water deposits have sent way too many steam irons to their premature deaths. The good news is that you don’t have to worry about this very common steam iron problem if you buy the Team SPS511 C Efbe Schott Steam Pro Spray Iron. Thanks to this model’s anti-calcium buildup features, your iron’s small water channels won’t doom it to early replacement. The SPS511 is designed to slow down or fight off alkaline buildup. 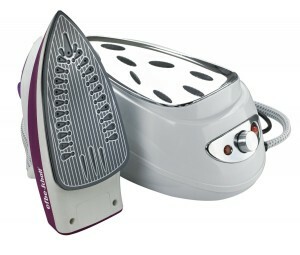 One of the biggest drags to quick, effective, and efficient ironing is the iron’s soleplate. The material composition of this part of a steam iron can lead to small fabric surface friction which can add up to a slower ironing session. Also, if you are already tired from ironing a moderate to heavy load, the drag on your iron’s soleplate can definitely weigh your arm down and tire you out even worse. Since the Team SPS511 C Efbe Schott Steam Pro Spray comes with a ceramic soleplate, you get a ‘gliding’ sensation as you iron. This makes ironing less of a hassle and you can tear through ironing loads sooner rather than later. 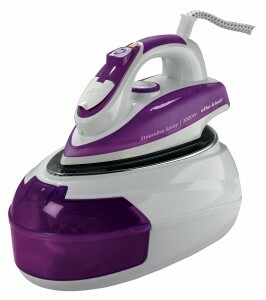 While this iron is definitely on the heavier side as far as its product category is concerned, this unit’s heavy duty steam power, its quick gliding soleplate, its high heat levels and heavy steam production and its low cost make it quite a compelling value. It’s probably best to contact the company directly, they should be able to help you with getting a new tray for your iron.